The only thing lovelier than a beautiful bouquet of flowers is a beautiful bouquet of edible flowers, or at least, it certainly is to some people. This is why products like chocolate roses and Edible Arrangements have taken off in recent years. For a baker, the same concept can be realized with this Flower Basket Cake Pan. The ring-shaped pan has large cupcake-type depressions, each of which has been fashioned either into a basket or a bouquet shape. The little cakes are baked and stacked one on top of the other, forming beautiful – and edible – flower baskets that are the ideal cakes for spring. A simple glaze or sugar coating would highlight the molds, but a pastry bag filled with colorful icing would serve even better. Each of the molds on the pan holds the equivalent of two cupcakes’ worth of batter, so bearing this in mind, each fully assembled cake could certainly be expected to serve more than one person – especially if you are generous with the frosting and decorations. What are demerara, turbinado and muscovado sugars? 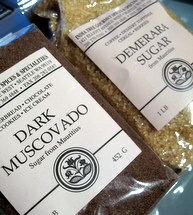 Next PostNext What are demerara, turbinado and muscovado sugars?